Ranell Hansen - She Sews a Magic Quilt to Keep her Safe on her Journey Home. She Sews a Magic Quilt to Keep her Safe on her Journey Home. 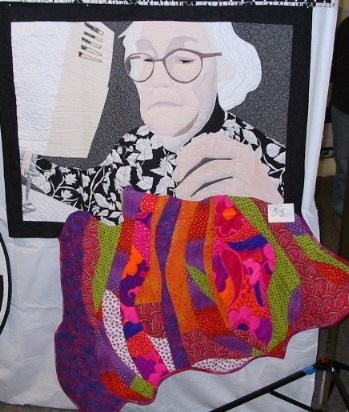 This quilt was made in honor of a friend who passed away before she could see it. She was in her 80's when I met her, and was a huge influence on my life. The original quilt was made to satisfy the theme, Black and White with a Touch of Color. When I found out that she had died, I decided to break the rules. My friend Peg was not a black and white person. On the contrary, she was very colorful. She taught me that just because you are old does not mean that you are boring or conservative. She was adventuresome, inquisitive, opinionated, and a little wild. I added the multicolored quilt hanging off the borders making the piece contain more than a touch of color, and bigger than the rules allowed. Peg also taught me that it is sometimes OK to break the rules.